Im Auftrag der Active Communications. Produktion & Gestaltung. Redaktion: Peter Praschinger. Der Messecheck - Gestaltete Reportage mit Protagonisten. Ausschnitte aus den letzten Jahren. Musikvideo im Auftrag von Bunka Records. Website Video mit Sylvia Sabin. We would love to help you with our services in the matter of video concepts, production or rental of videoequipment for professional use. Our team consists of creative and technical people that are working for national and international tv stations and press agencys. Our broadcast videoequipment can record in ntsc or pal, so your workflow is always safe. 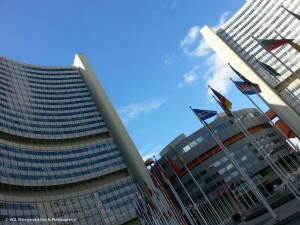 Our office is located only two subway stations from the center of vienna or 4 stops to the united nations UN headquarter. Contact us during the weekend, if the problems does not let you sleep. 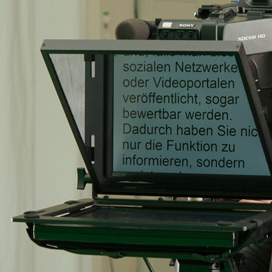 We’ll also can assist with the need of teleprompters, even if you need them behind the glass for a camera setup or a presidial speech prompter, as well as videolivestreaming and multicamera productions. all you need for recording a show in hd or sd! Behind the glass video teleprompter and speech prompters! 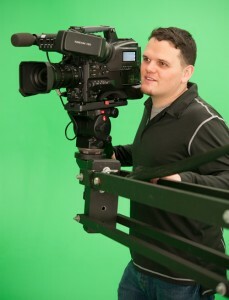 Looking for a broadcast tv- and videoproduction company in Vienna / Austria? Please contact us for your customized offer. Call +43 699 133 88 123.